Tree:Big Horn flexible tree, with exclusively designed Gaited Horse bars. Swells have leg cuts for security. Horn: 3" x 2 1/2". Gullet : 6 " wide x 8" high. Rigging: Double option rigging: Western, front to rear balanced ride single tie, or Conventional 7/8 position dropped D, solid brass. Skirts: 25" x 15". Tunnel skirt design with SilÐCushª "no pressure point" padded bar positioned between the bar and the perforated top grain leather skirt liner. Provides closer contact, a no slip fit, and easy cleanÐup. Fenders: 19" x 8". 2 1/2" leather stirrup leathers with stainless steel stirrup buckles. Stirrups: Leather covered Visalia, 6" tread width with SilÐCushª padding. Helps prevent knee & ankle fatigue. Finish: #2 Brown with new border trim. Trim: Solid brass hardware with latigo tie strings. Back crupper dee. Tree:Big Horn flexible tree, full quarter horse bars. 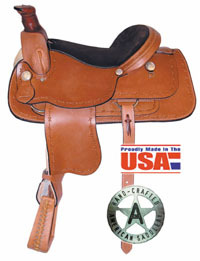 Cantle:5"
Seat: 16" or 17". Perforated top grain leather seat, with ViscoÐElastic Memory Foam Extra Soft Seat Padding. Horn: 3" x 2 1/2". Gullet :7" wide x 6 1/4" high. Double option rigging: Western, front to rear balanced ride single tie, or Conventional 7/8 position dropped D, solid brass. Skirts:25" x 15". Tunnel skirt design with SilÐCushª "no pressure point" padded bar positioned between the bar and the perforated top grain leather skirt liner. Provides closer contact, a no-slip fit, and easy cleanÐup. Fenders: 19" x 8". 2 1/2" leather stirrup leathers with stainless steel stirrup buckles. Stirrups:Leather covered Visalia, 6" tread width with SilÐCushª padding. Helps prevent knee & ankle fatigue. Finish:#2 Brown with new border trim. Trim: Solid brass hardware with latigo tie strings. Back crupper dee. Weight: 30 lbs. The three-quarters tooling pattern on this roper is a combination of hand stamped basket weave and hand carved oak leaf. 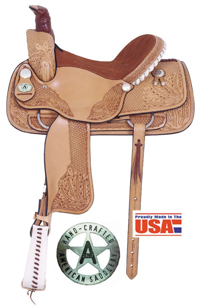 The cantle is rawhide with silver lacing and leather overlay. Finished out with silver conchos. Medium oil only. Tree: Fiberglass-covered Bowman Roper, Swell 13", Gullet width 63/4", Quarter horse bars; Weight: Approximately 42 lbs. 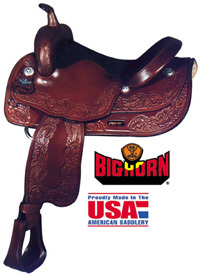 ; Horn: Height 31/2", Diameter 3" leather covered with latigo horn wrap; Cantle Height: 31/2"; Skirt Length: 271/2"; Skirt Width: 14"; Stirrup Leathers: 3" with Blevins buckles; Stirrups: Hand-laced rawhide-covered deep ropers; Rigging: Stainless steel dees in 7/8 position. Tree: Big Horn flexible tree, full quarter horse bars. Seat: 16" or 17" grainout with Dual Density Memory Foam Seat Padding. Stirrups: Leather covered Visalia, 4 1/2" tread width. Trim: Solid brass rings and leather ties. Back solid brass crupper ring. Tree: 16" hardwood fiberglass-covered Professional Endurance, Swell 12 1/2", Gullet width 6" Weight: Approximately 31 lbs. 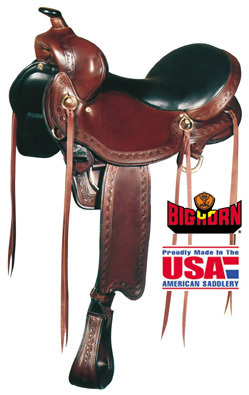 ; Cantle Height: 2 1/2"; Skirt Length: 23"; Skirt Width: 11" Stirrup Leathers: 2 1/2" with Blevins buckles; Stirrups: Visalia with leather foot pads; Rigging: Brass rings in 3/4 position. The Pro Endurance is our finest endurance saddle which gives it the right to carry the Mastercraft logo. This model sports a top grain chop leather seat. Made with ShoTan’s mellow tan golden skirting to give it a soft and supple feel. 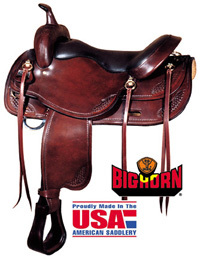 Tree: Fiberglass-covered Equifit® Endurance, Swell 9 1/2", Gullet width 7" Weight: Approximately 21 lbs. 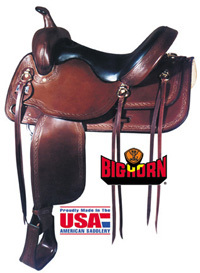 ; Cantle Height: 4"; Skirt Length: 24"; Skirt Width: 11" Stirrup Leathers: 2 1/2" with Blevins buckles; Stirrups: Leather-covered Visalia; Rigging: Stainless steel C-rigging in 3/4 position. Available in medium oil. 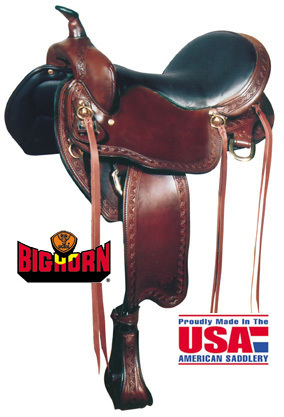 The Barb Wire Laredo combines traditional saddle features with craftsmanship. 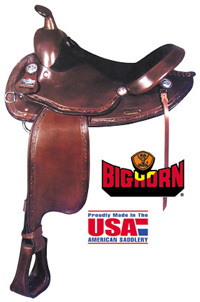 This classic design features barb wire border tooling and silver conchos. Available in medium oil only. 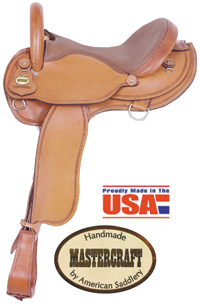 Tree: Amtech Roper, Swell 12", Gullet width 6 3/4", Quarter horse bars; Weight: Approximately 40 lbs. 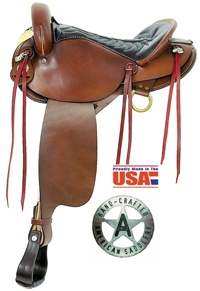 ; Horn: Height 3 1/2", Diameter 3", Leather-covered with latigo horn wrap; Cantle Height: 3 1/2"; Skirt Length: 27"; Skirt Width: 12 1/2"; Stirrups: Hand-laced leather-covered deep ropers; Stirrup Leathers: 3” with Blevins Buckles; Rigging: Stainless steel dees in 7/8 position, 1 3/4" rear billets with 3" rear cinch. Tree: Fiberglass covered wood tree with bars designed especially for draft horses. Seat: 17 1/2" rough out, padded. Skirts: 27" x 13 1/2". Trim: Silver conchos, spot tooled with oak leaf border. Seat: 16" rough out, padded. Tree: Ralide, with bars designed especially for the Haflinger. Horn: 2 1/2" x 2 3/4". Trim: Oak leaf border with silver conchos.